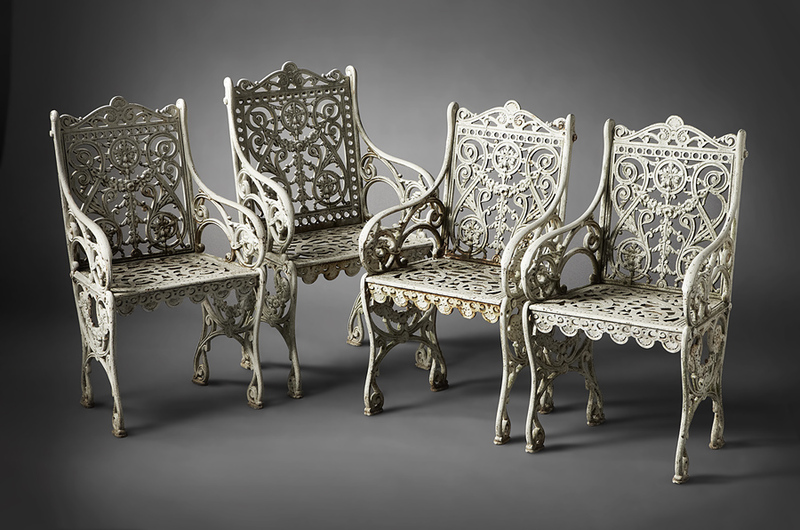 A a set of four cast-iron Boston Panel armchairs, the square back pierced with scrolls, swags and stylized foliage, the seats with arabesques, and the curved supports with swag motif, marked with patent date of April 7, 1903, American, early 20th c. 35.5 ins. High, 20 ins. Wide, 16 ins. Deep. These curtain-style chairs, termed "Boston Panel," were offered by a few American manufacturers. Evident in the seats is a combination of vegetal arabesques�relating to Arts and Crafts designs�and classically inspired floral swags. This particular pattern always includes a scalloped front apron. M.D. Jones & Co. of Boston illustrates the armchair, along with coordinating settees, in its ca. 1903 catalogue. A great garden item.